The Chicken Bucket: News / Comments / No Quarter and You. 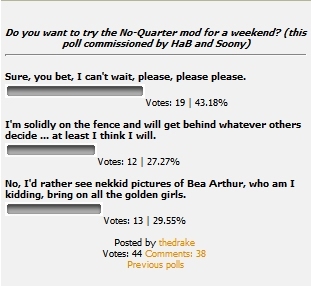 Well, by a 19-13 margin, you guys (and gals) have voted for a No Quarter weekend. We will let you know the details once we figure them all out. "huked on fonics reely wurked fer mee." Oops, R-Nade. Poll was up for a week (last week - see bottom right corner of main page for polls). No fair! Soonie stuffed the ballot-box! The engie can use a shotgun. Render time: 0.1808 sec, 0.1014 of that for queries.